As Sting kicks off the European leg of his Symphonicities tour, it’s the right time to look back on some recent examples of rock turned into Western art music. Here’s another example: compare two string quartet pieces based on songs by the perpetually-relevant band Radiohead, both recorded by the Vitamin Quartet. In their 2009 version of the most recent Radiohead album, In Rainbows, the Vitamins add their fair share of outside percussion. And who can blame them — the opening of “15 Step” is tough to recreate on four string instruments. But on “Idioteque” from their Enigmatic — The String Quartet Tribute To Radiohead, the quartet dispensed entirely with Radiohead’s intense percussive underpinning.4 I lean toward their "Idioteque" cover — after all, if I’m buying a string quartet album, it should essentially be a string quartet album. Right? But not all bands are equal, and what makes the music of the Grateful Dead easier to classicalize than either Sting (aside from Sting’s humongous ego) or Radiohead (aside from the fact that they already seem to be in the classical canon) is the flexible nature of the Dead’s songs as texts. You probably wouldn’t bother turning a single Dead album into a “string quartet tribute” because those songs exist less in fixed album form than in thousands of bootleg tapes and millions of faded memories. The best classical version of the Dead, perhaps, is something that approaches the feel of a live Dead show. In his Symphony No. 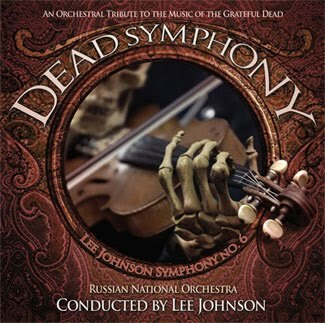 6 (“Dead Symphony”) (2007), Lee Johnson seems to have succeeded in creating just that. 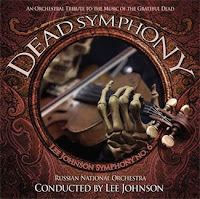 This symphony does have 12 movements (let’s call them “tracks” like the Deadheads do, and as they appear on the version recorded by the Russian National Orchestra), not unlike a rock album. And you’d be forgiven for thinking of it more as a concept album for orchestra — perhaps the “Orchestra Tribute to the Grateful Dead” — than as a symphony (not that we’re challenging the composer’s label). But the Dead Symphony works precisely because Johnson doesn’t care about reproducing the sound world of the Grateful Dead. A “Dead Overture” and the “Dead Finale” bookend orchestral re-imaginings of 10 Dead songs, and it’s these opening and closing pillars that make the Dead Symphony cohere. The overture is no Broadway introduction — it (along with the Finale) is made up of riffs on “Finiculi, Finicula,” a nod to Dead fans who know that the band used to play around with this song in their shows. By starting this way, Johnson accomplishes two things. First, he gives a knowing nod to the Deadheads, assuring them that this might be like a live Dead show, no matter how refined and polished some of it might sound.5 And second, he orders the Symphony-heads to relax and enjoy the orchestral version of a live Dead show, no matter how friendly and poppy some of it might sound. Throughout this symphony, the ponderous, unnervingly solemn movements far outweigh the light ones, which surprised me for a reworking of such a zany, whimsical band’s material. A sense of foreboding underlines even the most seemingly quirky moments, like in this example from the end of movement 9, “Stella Blue." Otherwise, I’ll leave it to the Deadheads to comment on track sequencing and all the hidden references I definitely missed. One final thought: could Johnson have gone further? For one of these rock-turned-classical albums to work, it probably does need to be divided, like the Dead Symphony, into several songs/movements, with one song highlighted per movement. Violating the integrity of the “track,” no matter how flexible it is, would probably alienate the fans of the group who would buy that album and expect to hear their songs in full (I am surprised, though, that in this symphony, some of the movements don’t fade into each other, like Dead songs often did during live concerts). Personally, I’d like the next rock-inspired symphony to explode the traditional pop-album structure. That’s why, while you’re listening to the Dead Symphony, I’ll be working on my own four-movement Symphony No. 1 — Sting vs. Radiohead: Celebrity Deathmatch. 1. Caution: this could lead to Billy Mumphrey's downfall. 2. This review in Variety sums up the issue well. 3. But I would gladly do either anyway. 4. In the version on their Kid A tribute, the Vitamin Quartet used strings to create an impression of those drums, but they didn't go as far as they later would on "15 steps." 5. A post I saw on the Dead’s official Web site points up the Deadheads’ fanatical hunger for live renditions of their favorite music. After the announcement of the world premiere, with the Baltimore Symphony Orchestra, in 2008, one fan asked if taping was allowed — a tradition at Dead shows, but certainly not at the Meyerhoff. The first time I've ever seen a rock-classical symphony... I heard John Rutter's Beatle Concertos a while back but this is quite unlike anything I've seen (heard?). So awesome, I think more of this cross-over stuff would really help raise classical appreciation. Jake, thanks for your response and good luck on your own blog! PPP: Never heard the Beatle Concertos — can you tell us more about it?